Unmanned aircraft are no longer just flown recreationally by model aircraft enthusiasts; they are now being increasingly used in a professional capacity for aerial filming, surveillance, and data gathering, for example. Due to the increased popularity of unmanned aircraft, also known as unmanned aerial vehicles (UAV) or ‘drones’, the CAA introduced new regulations in January 2010 which require operators of small drones, when used for data acquisition, aerial filming, and surveillance, to obtain permission from the CAA prior to commencing a flight within a congested area or within a certain proximity to property or people. There are a number of UAV flying courses available that will qualify pilots for a CAA permission for aerial work; however, these qualifications do not necessarily teach candidates how to fly a drone, or how to perform aerial work activities such as aerial filming or surveying. The drone flying lessons we offer at Drone Builders will teach you how to fly an unmanned aircraft for a number of different applications. However, please note that although our drone pilot training courses are comprehensive in teaching you to pilot a drone, they do not qualify you for a CAA permission. We believe that no drone pilot can be a safe operator unless they have a fully comprehensive technical understanding of their aircraft and equipment, which is why we place a great deal of emphasis and importance on this aspect in all of our drone flying courses. Drone Builders’ Basic Course is suitable for pilots that are new to flying. Our instructors will begin by taking you through your drone to give you an understanding of its systems and capabilities. You will then proceed outside for the basic level flight instruction, which will give you a foundation on flying skills, different flight modes, and flight safety. The Basic Drone Flight Course lasts approximately 4 hours and you will be provided with refreshments. Drone Builders’ Advanced Course is suitable for those who already have the ability to fly, but lack the experience of working with clients. Our instructors have extensive experience in commercial drone operations and will teach you what to expect when working with a client. This includes good airmanship, the management of client expectations, and a solution-finding approach to your operations. The course also includes tuition on different flying styles to help achieve the best results in different scenarios. The Advanced drone Flight Course lasts approximately 4 hours and you will be provided with refreshments. All prices quoted above exclude VAT. 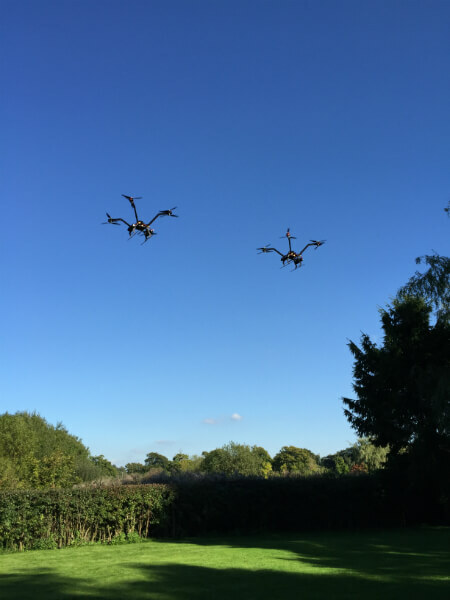 If you’d like to find out more about either of our courses, or about any of the other services that Drone Builders offer, please don’t hesitate to contact us and we’ll be more than happy to help. PLEASE NOTE: It is illegal to fly a drone for “valuable consideration” i.e. for any kind of reward, even indirect, without a CAA permission for aerial work. Courses that can qualify pilots for this permission include the BNUC-S from Euro USC or the RPQ-S from Resource Group.